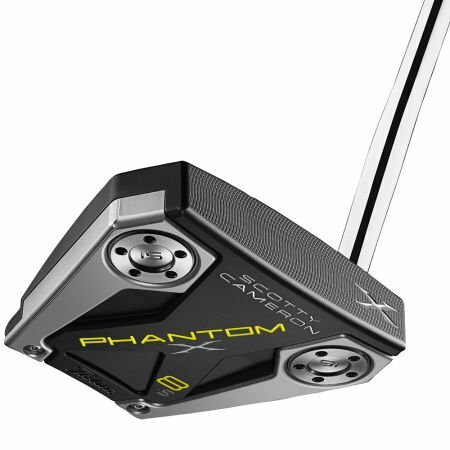 Differing from the Phantom X 8 only in shaft bend length and toe hang, the Phantom X 8.5 offers players an unbroken, sculpted flange from the putter’s leading edge through the back flange with a short single bend shaft to promote a slightly arced putting stroke. Alignment is easy with bright visual cues. CONTINUOUS ALIGNMENT - Free from visual distractions or a true topline at address, the entire surface is used for continuous alignment incorporating milled sight lines from the leading edge through the back flange including milled sight dots to frame the golf ball and define the sweet spot. LOW-BEND SHAFT TECHNOLOGY - The stepless steel shaft has been designed with a single 'low' bend aimed directly down the target line to slightly enhance toe flow— or arc —in the putting stroke.